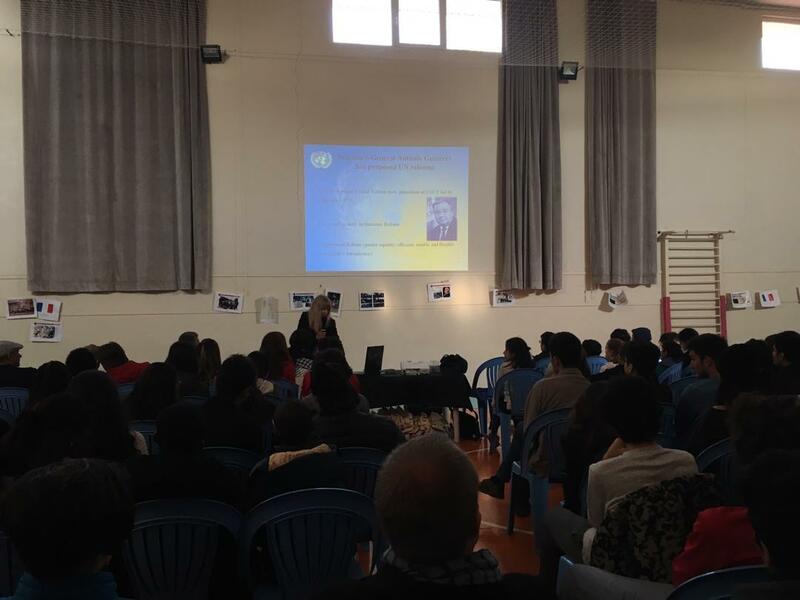 More than 70 students and teachers from the French School in Tehran learned more about UN history, UN values, agenda of UN Secretary-General and what UN does in Iran. Maria Dotsenko, UNIC Director spoke to students and answered their questions at the French School on 19 November 2018. More than 70 students and teachers from the French School in Tehran learned more about UN history, UN values, agenda of UN Secretary-General and what UN does in Iran. Maria Dotsenko, UNIC Director spoke to students and answered their questions at the French School on 19 November 2018. Short videos on UN history with Persian subtitles where screened to the audience and UN informational materials were distributed. The event was organized by the teacher of English language. Kids also learned more about Sustainable Development Goals while playing go-goals game together. Go-goals game was designed by UNRIC Brussels and now is popular among school children in many countries.